Dear Outer Space: AWP Bound! Boston will be cold. I wish I had a pretty coat that was warm and would also fold into a tiny, portable swathe. This year I won't be staying at the conference hotel as I have in years past. Also, this is my first year not tabling at the book fair for Weave Magazine. Just me toting my coat and my chapbook around a giant convention center. By the way, if you see me please say hello. I really love meeting people I know only online. I apologize if I don't recognize you at first, but to be fair, I'm pretty bad at names and faces. I'll be glad to meet you! If you want to pick up a signed copy of Braiding the Storm, I will have them in tow. As a special promotion, if you buy BtS I will write you a personalized poem on a Boston postcard. Buy my chapbook, get a postcard poem later! Win-Win. I'm looking forward to being a rogue agent this year. This is my fourth AWP and I'm taking my past experiences and applying them to this year. Pace myself. Sit near the back. Make time for the book fair. If I get to 2-3 panels in one day I'm happy. It's hard to go go go. They should have time-out rooms at AWP with quiet music, soft lighting, lots of pillows. Except everyone would likely be there most of the time. I'm excited to go to the book fair and collect stickers. Decorating my AWP notebook is going to be my new tradition. 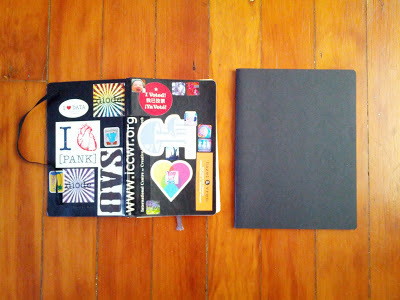 This year I have a larger, unlined journal and it will be beautiful.